I use a lot of pocket hole joinery in my projects. Every face frame I build uses at least four pocket holes. Recently I decided to upgrade from my basic Kreg Jr. jig to a pneumatic Kreg pocket hole machine. This has considerably sped up the process. I could start a cabinet business, if cabinet building was only about face frames. The latest new development in this area is the Porter-Cable 560 Quik Jig, which aims to be a better pocket hole jig. I bought one for the explicit purpose of writing a review for my readers. Let's see how it stacks up against Kreg's low and high end products. If you want to see it in action, take a look at the excellent video Woodcraft shot at IWF this year. Construction of the jig is high quality. I have little doubt that the jig can handle anything the hobbyist can throw at it. It will never break in a home woodshop environment. For production, however, I fear the jig has too many moving parts. There is just too much that can go wrong. Since I have not used the jig in such an environment, consider this a guess rather than a fact. Right from the start I was impressed by the Quik Jig's base plate. Unlike the Kreg, which is built from nylon/plastic, the Porter-Cable version is made from aluminum. The added size and weight helps the jig stay in place when handling longer boards. I never needed to do this, because the Kreg Jr. line clamps to the end of the work piece rather than the other way around. Working on the pieces vertically works fine up about 3ft. It is still possible but inconvenient from 3-5ft. To drill pocket holes in longer pieces the jig must turned 90 degrees. The work piece can then be inserted into the jig horizontally. While all of these operations are possible, they sometimes end up being inconvenient. For low volume work this observation should not be a concern. Like the Kreg Jr. it takes care to use the tool properly. The Quik Jig is not fool-proof. The jig must be located in the proper spot and clamped in place securely. These are not difficult task, but they do take some time. The pocket hole machine, on the other hand, has just one setup. The pocket hole gets drilled in about a second. In the same spot, every time. Horizontally aligning the pocket holes is somewhat difficult with the Quik Jig. It has a center line at the top of the jig, which does line up with the center of the pocket hole. The line, however, is far away from where the actual pocket hole is being drilled. When I lay out my pocket holes I make a mark the end of the board where the pocket hole is located. This mark is obscured by the Quick-Jig's body. In order to precisely locate a pocket hole I have to change my operating procedure and mark the board about 8-10 inches from the end. Again, this is a small problem. For me, however, it makes the jig a little harder to use. The drilling operation is where Porter-Cable brings great innovation to the game. The work piece is held in place by a clamp. This clamp can be moved in an out by loosening the big round knob that dominates the tool's front. Simply push the clamp close to the work piece, tighten the knob, and push down on the clamp lever at the front of the tool. In addition to securing the work piece in place, this action sets the jig at the correct depth. The pocket hole will be in the correct location no matter how thick the work piece is. The Kreg Jr. jig requires a few minutes of adjusting the guide block. Re-adjusting the Kreg pocket hole machine takes so much time that I usually use my Jr. jig instead. The machine is permanently set to 3/4" stock. The Porter-Cable jig is a great tool for your shop, if you need to drill pocket holes in stock of varying thickness on a regular basis. As nice as the auto-thickness adjust feature is, I like the 560 Quik Jig's ability to change the spacing between the two pocket holes better. By default, the jig can drill two pocket holes without having to unclamping the piece. Like on some Kreg models there are two channels for the drill bit. Unlike the Kreg products, on the Quik Jig the distance between the two guide holes can be set with a set screw. This is a significant time saver compared to the Kreg Jr. line of jigs. The pocket hole machine needs two cycles for drilling two pocket holes. It's still faster, because the actual drill cycle takes much less time. In actual use I have a split opinion about the Porter-Cable Quik Jig. On one hand it does make it easier to drill pocket holes than the quick jig. On the other hand it would never replace my pocket hole machine. The Quick Jig finds itself in an uneasy position between two specialists. Repeatable, fast pocket holes in 3/4" stock, which is 90% or more of most people's work, are best done on a dedicated pocket hole machine. One-off operations, pocket holes in tight spaces, or on extra long work pieces are best done with the clamp-on style Kreg Jr. line. Yes, the Porter-Cable Quick Jig is faster for everything in the middle, but it's not where you will find me very often. The most significant contribution to pocket hole joinery the Quik Jig makes could probably be the fact that it puts pricing pressure on Kreg. The Quik Jig is superior to all but the basic line of Kreg jigs. It performs much better than the Kreg Master system. Prices for the premium Kreg jigs will come down over time. In summary, the Quik Jig is a marvel of engineering. It will hopefully be the first tool in a wave of innovation in the area of pocket hole joinery. It's natural environment is a shop that requires pocket holes in many different types of stock. The hobbyist is better served by much cheaper, but slower to use, clamp-on type jigs. For professionals there is no way around a pocket hole machine. 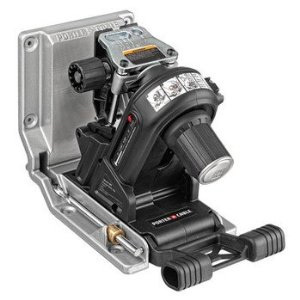 Users who want to speed up their pocket hole drilling operation, and who know they will never need the capacity of a pocket hole machine, might be very happy with the Porter-Cable 560 Quik-Jig. The jig does what is was engineered to do. It won't break easily and will serve you well for years. This is a good tool, if it fits your needs.